Research Verified Brain Booster Review - Is it Effective? Safe? Overall Rating? This is an in-depth review of the product Brain Booster by Research Verified. After extensive research we found Research Verified’s Brain Booster to be one of the best brain boosting supplements on the market. Research Verified claims that this product contains a dual action formula that can not only provide short-term cognitive optimization but can also boost the long-term cerebral health. Read on to find out more about the Research Verified Brain Booster and whether or not it stands up to the claims made by the manufacturer. Other ingredients include Magnesium Stearate and Calcium Carbonate. It is recommended that adults take one capsule of this product twice daily, preferably before a meal with an 8 oz. glass of water. There are no serious side effects of this product as it is made up of natural ingredients. However, you should not exceed the recommended dosage. Anyone with a known medical condition, children under the age of 18 as well as pregnant and lactating women should only use this product after consulting with their physician. Research Verified Brain Booster is offered in a variety of packages including single bottle, three bottles, and six bottles package. On the Research Verified’s website, the regular list price of a single bottle of this product is mentioned as $69.95, but it is currently marked down to $48 and the six month’s supply is being offered for $142, which totals $24 per bottle. The manufacturer of this product offers a surprisingly strong 365 days money back guarantee. So, if you are not satisfied with the product and you feel that it is not showing the desired results then you can return it at any time within a year and you will be provided a full refund even if you have already opened the bottle. All you have to do is cover the shipping cost of returning the product. This generous return policy makes the multi-bottle packages that they offer a tempting deal because if you decide that you don’t like the product then you can easily return it. 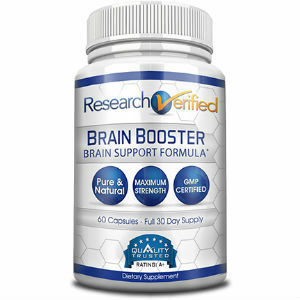 Compared to the other brain-boosting products that we have reviewed, it seems that Research Verified Brain Booster is one of the best on the market. Their capsules are packaged at the same dosage and strength that is recommended by the clinical studies and the ingredients of this product are hundred percent pure and don’t include any preservatives or artificial coloring hormones. In addition to this, their 365 days money back guarantee is amazing and when we looked at the customer testimonials, we found many satisfied reports confirming the effectiveness of this product. So, if you are serious about your cerebral health and cognitive development then Research Verified Brain Booster is definitely the product for you. Henry Costa	reviewed Research Verified Brain Booster	on October 7th	 and gave it a rating of 5.